How do I access the quizzes and exams? How do I see my results? Our quizzes and exams are tied to our video lessons in our Courses (this article explains how to access courses). Please note that you must have a subscription to our Gold or Platinum plans or purchase a bar review package to access the quizzes and exams. 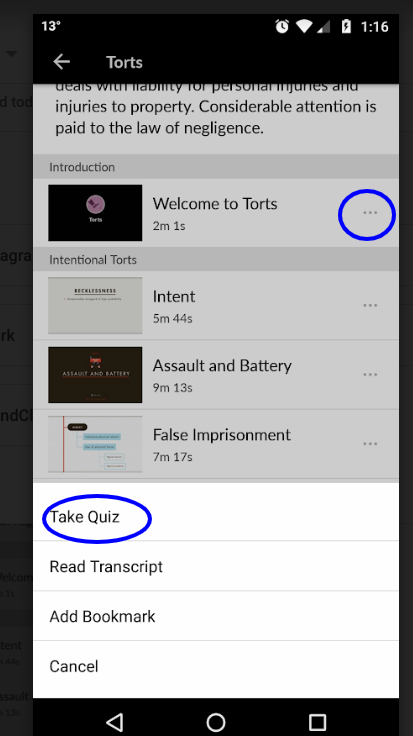 Step 1: Once you're on a specific course page on our website, along the left side, you'll see all the chapters within that course, and a link to "Take quiz" underneath a video's title. Then, at the bottom of each section, you'll also see a link to the "Final Exam." Step 2: Once you click "Take quiz" or "Final Exam," you'll be presented with a series of practice questions and possible answers. When you arrive at the final question, provided you've answered all of the questions, you can click on the "Submit" button, and your results will appear. On the left side, you'll see your quiz results, and you can click on each number to jump to that question and answer, or click the button to "Retake the quiz." On the right side, you'll see your answer, the correct answer (if different), and a brief explanation.